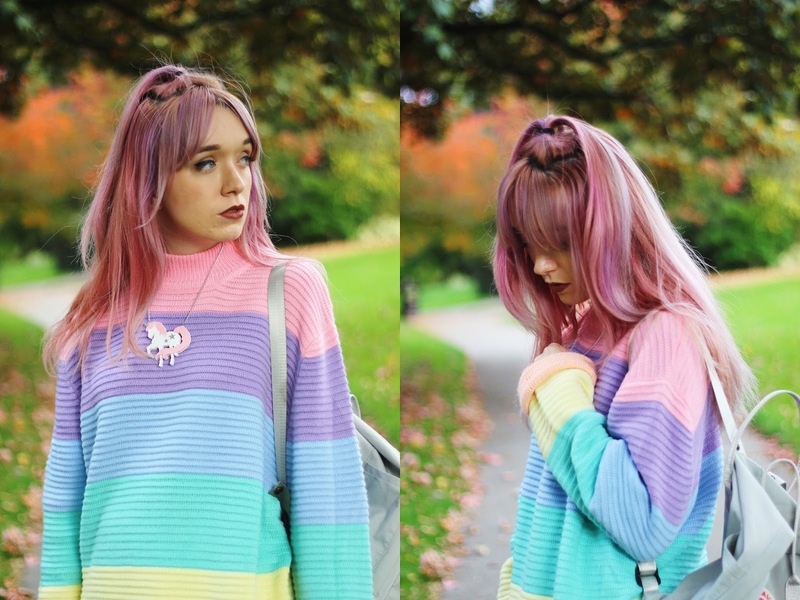 When I first came across this pastel striped jumper on the UNIF website I just knew it just had to be mine-to fulfil all of my pastel coloured dreams. Everything from its high neck shape, to having every pastel shade under the sun plastered all over it. This jumper is certainly one that has stolen my heart. As it was my first ever UNIF purchase (and order) I was slightly concerned about the sizing of such an item, as it can take up to a couple of weeks to arrive due to international shipping, and I desperately didn't want to be disappointed. Nevertheless I wasn't. In fact sizing wise it was near to perfect, although you could probably get away with going a size down due to its oversized nature. For todays outfit I decided to pair it with a couple of simple, key pieces such as this white skater skirt and grey backpack as I really wanted the jumper to be the eye-catcher of the whole look. Topped off with an (obligatory) unicorn necklace, my pastel (kawaii) inspired outfit was complete.